Clear, aesthetic braces are an increasingly popular choice with adults and teenagers, as they are less visible than traditional fixed braces. 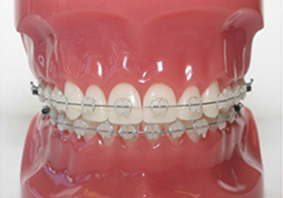 Brackets on aesthetic appliances are generally clear or tooth coloured. White or tooth-coloured wires can also be used for an even more discreet, natural look. Aesthetic appliances are only available as a private treatment option. We use Clarity ADVANCED 3M Unitek ceramic braces that are made from a translucent ceramic material which blends with the colour of your teeth and will resist staining or discolouration throughout treatment. With its small, low-profile design, Clarity ADVANCED braces are virtually unnoticeable, making them perfect for patients of any age who are looking for the confidence and the freedom to smile on any occasion.